I've been working a week ahead of you guys so I can have a post ready each week and as I was doing this weeks assignment I thought, "This is a lot." Now granted, I am doing the twin size quilt so there's a lot more to it than the baby or throw sizes but with laying out all 84 blocks, sewing all the rows together, pressing all the seams open, then sewing all the rows together with the sashing strips in between, and then pressing the whole thing again, well, it was kind of a lot. So, I made an executive decision that won't change the overall duration of the Quilt Along. 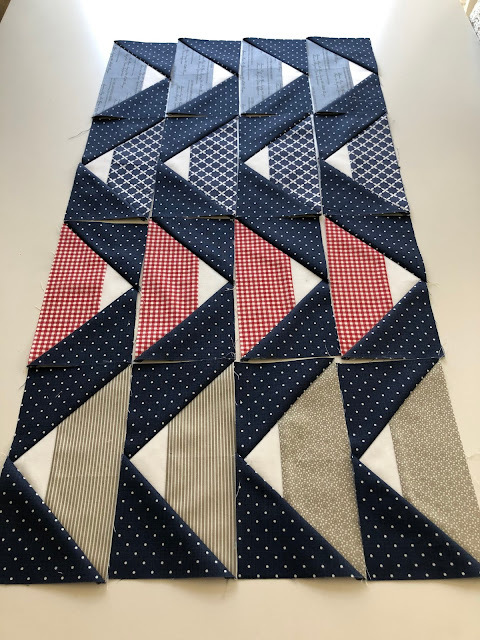 Do everything that I just listed above - assemble all the rows and sew them all together with the sashing strips in between. But this week you don't have to do the inner border. We will do all the borders next week. If you feel inclined to stick to the original plan of moving through to the inner border - go right ahead. 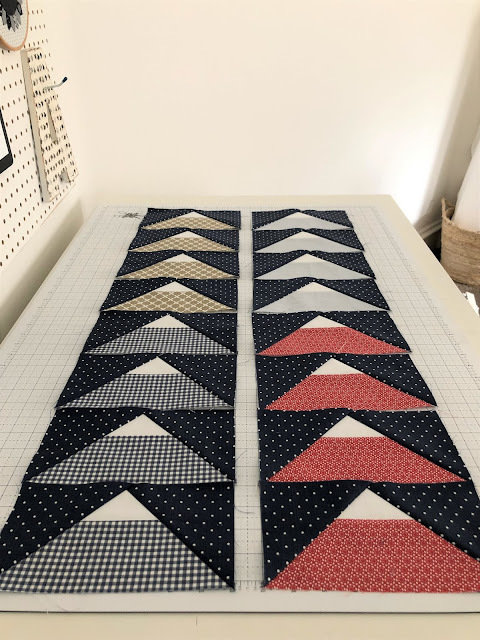 I do want to share a trick that I used to sew all my rows together. 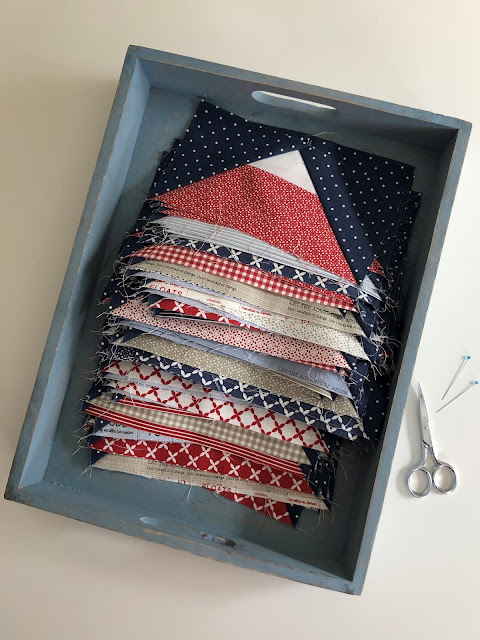 It keeps everything in order while saving time and thread. It's called the Spiderweb Chain Piecing Method. Have you heard of it? I've done a video tutorial and saved it to my highlights on my Instagram profile page so be sure to check that out. I know not all of you are on Instagram so for those of you that aren't - I am sorry! 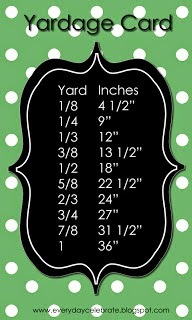 I really want to get a tutorial made for my blog so I'm adding that to my list of things to do! When you're finished making your quilt center, post a picture of it on Instagram. Use the hashtag #skipperqal so I can see it. 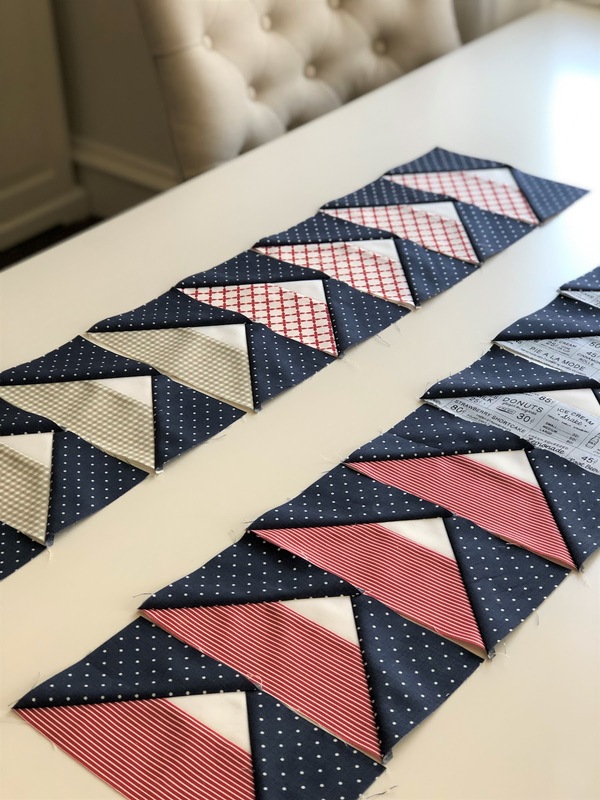 I love seeing all of the different colorways you guys are doing! There's no giveaway this week but keep plugging away and posting pictures on Instagram because the grand prize drawing will be soon! One of you lucky ducks is going to win free edge-to-edge quilting on your Skipper quilt from One Sweet Bee Designs (@onesweetbeequilts on Instagram). Thank you Barbara for being our fabulous sponsor! 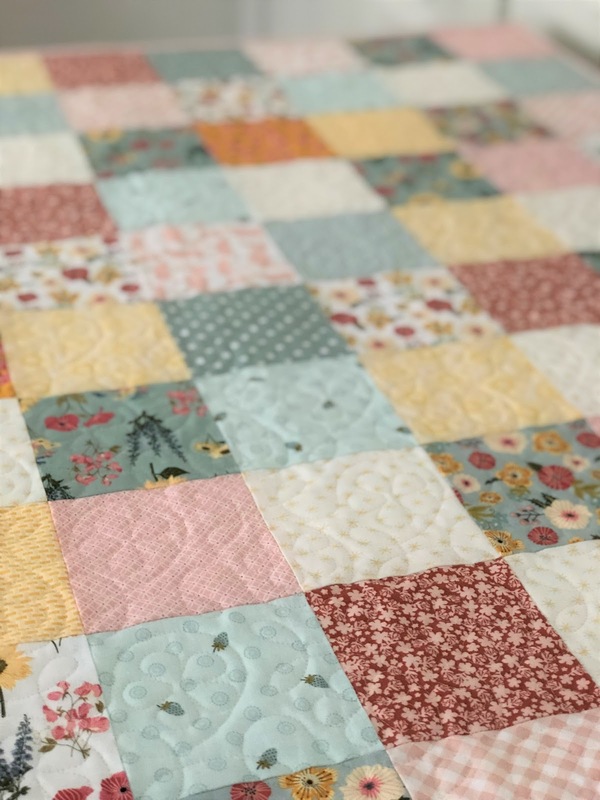 Speaking of prizes, it's time to announce the winner of last weeks' giveaway for the 6 Prairie Sisters Fat Quarters! Jennifer (@silverbarnes on Instagram) you are the winner! Please send me your full name and shipping address via DM on Instagram and I will get those shipped right off to you! I think you're going to like your little pile of blocks! 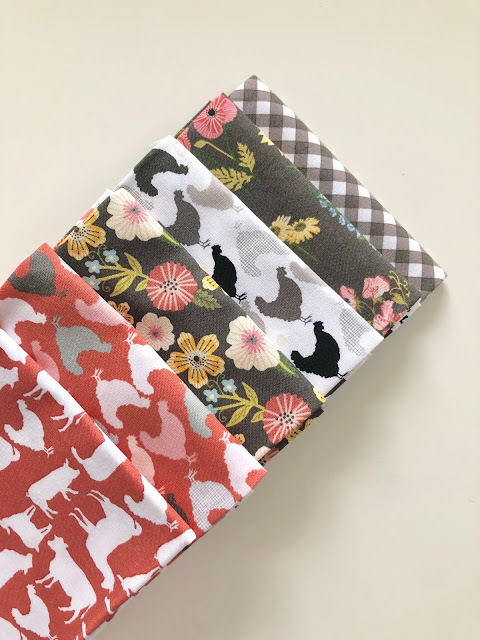 Just post a picture on Instagram of all your finished blocks on a plate, platter or tray and you will be entered to win these 6 fat quarters from the new line, Prairie Sisters by Poppie Cotton! 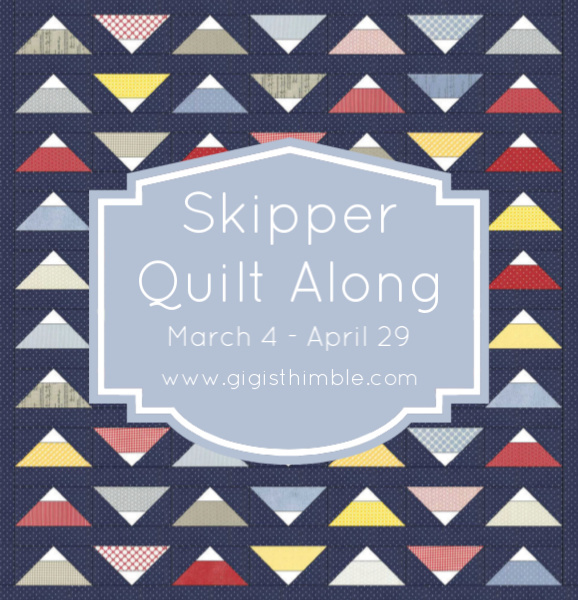 Be sure to use the hashtag #skipperqal so I can see it. I'll announce the winner here on my blog and on Instagram on Monday, April 15th. How is everyone keeping up? I love having a doable schedule (and all of you!) to keep me going! We're just over halfway done so you should be seeing big progress with your blocks! Next week is the last week of block-making before we start assembly the quilt so I encourage you to take time this week to get caught up if you're behind. Magee Pitkin (@mageepitkin on Instagram). 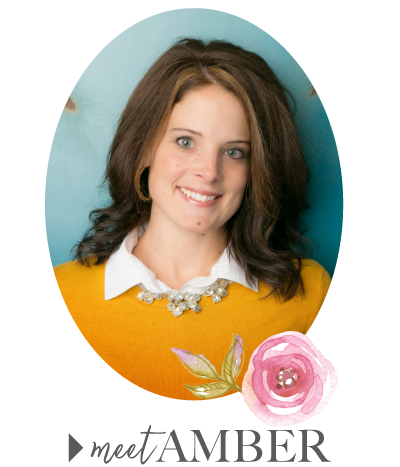 She is the winner of an IronEZ, a handy gadget I love and use all the time! Congratulations Magee! Please email me your address and we'll get that shipped right off to you. 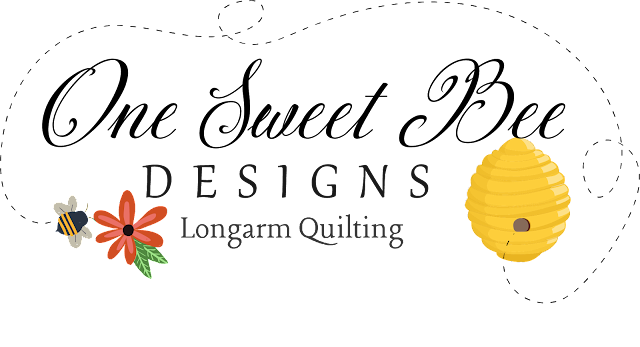 For anyone else wanting to get their hands on an IronEZ, you can visit their website HERE. For a limited time, you can get it for $19.99 + free U.S. shipping. I love having one on my ironing board, no more bottles falling off! 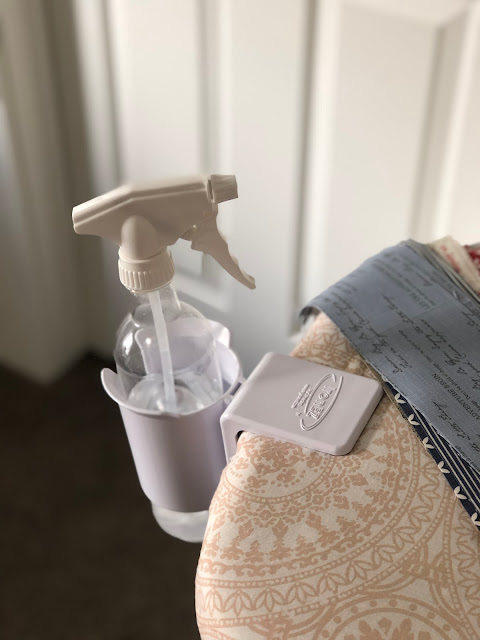 The holder clips onto your ironing board so your spray bottles won't fall off while ironing (#quilterproblems, am I right?!) The IronEZ comes with a fantastic spray bottle but it can also hold Best Press or a regular starch bottle, whatever you prefer to use! I also love the fact that the holder twists so you don't even have to remove the IronEZ to put your ironing board in storage. To enter to win an IronEZ, just post a picture of all your Skipper blocks on Instagram using the hashtag #skipperqal. 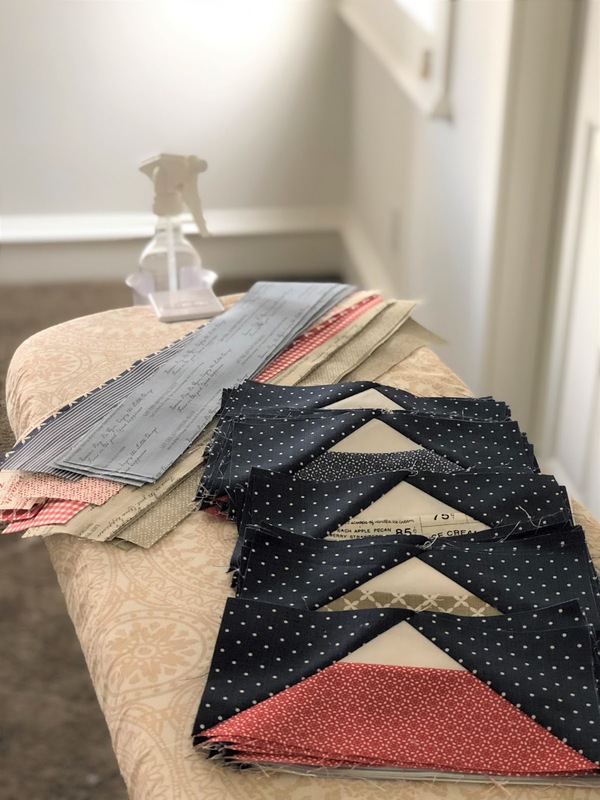 I want to see your progress and your fabrics! Post this picture by Sunday, March 31st at noon and I will announce the winner here on the blog and on Instagram the following Monday morning. This is a great week to get caught up if you're behind. (The only thing different than last week is the Queen size! 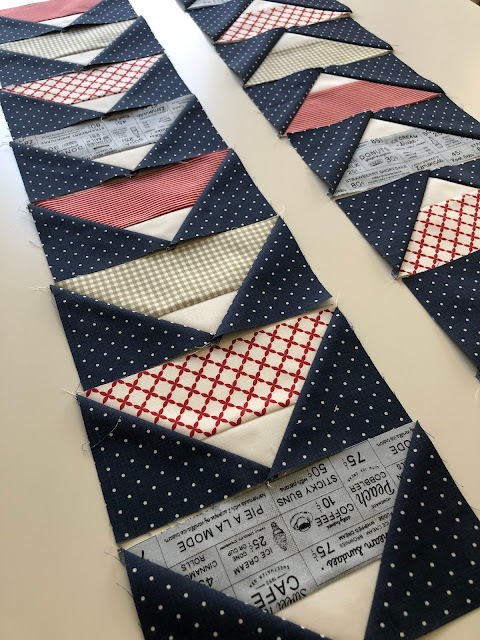 I'm having fun seeing these blocks come together and I am especially loving seeing your posts on Instagram! Thank you for sharing friends! 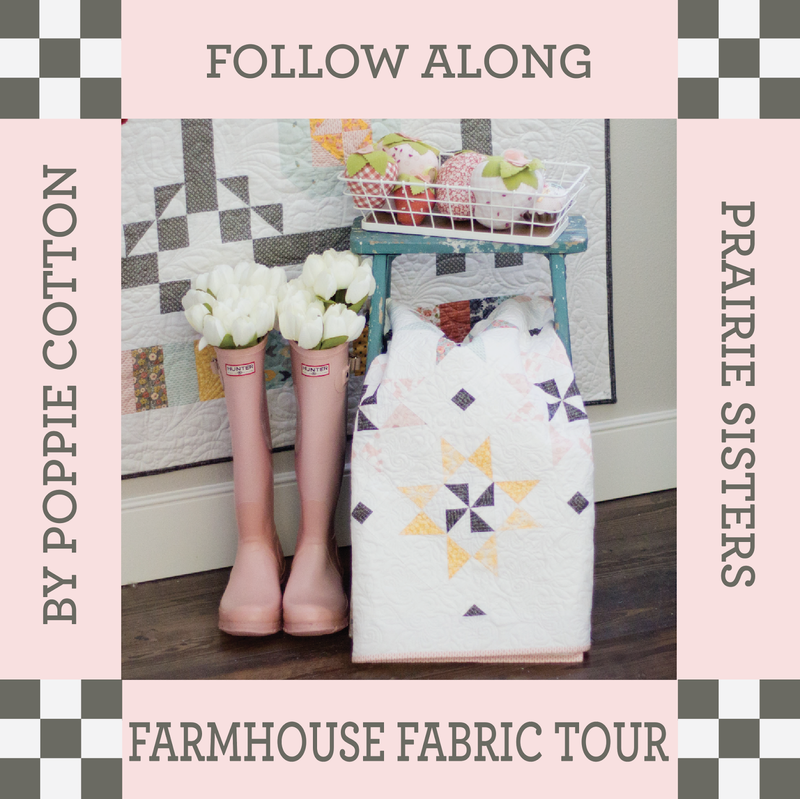 Prairie Sisters Farmhouse Fabric Tour! Prairie Sisters is a new fabric line by Poppie Cotton and is available in stores now. 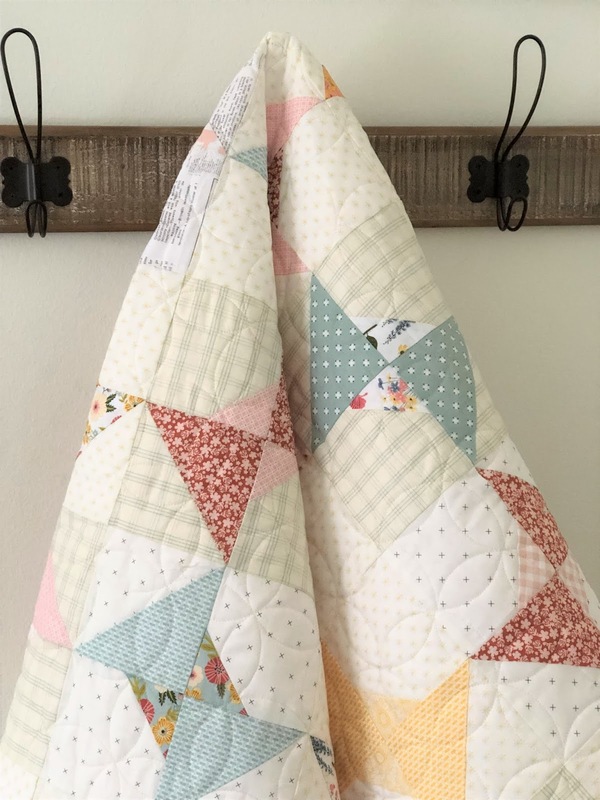 I love the soft colors, the variety of prints and the farmhouse feel of this line! It was nice working with a softer palette than I'm used to. I find that I'm craving the softer, calmer colors these days! 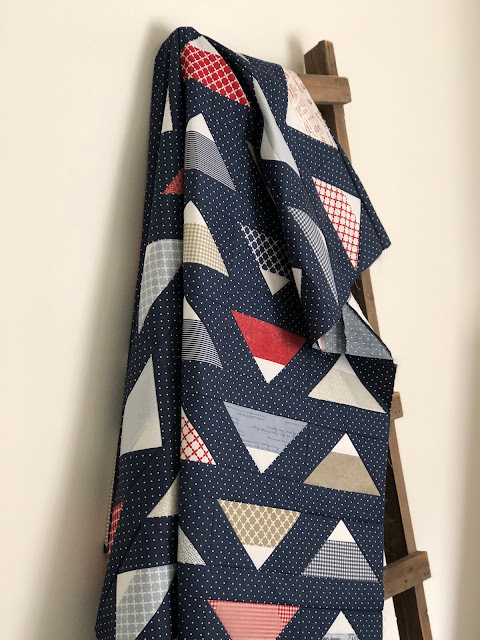 I decided to try out this pattern that I've had my eye on for quite some time! 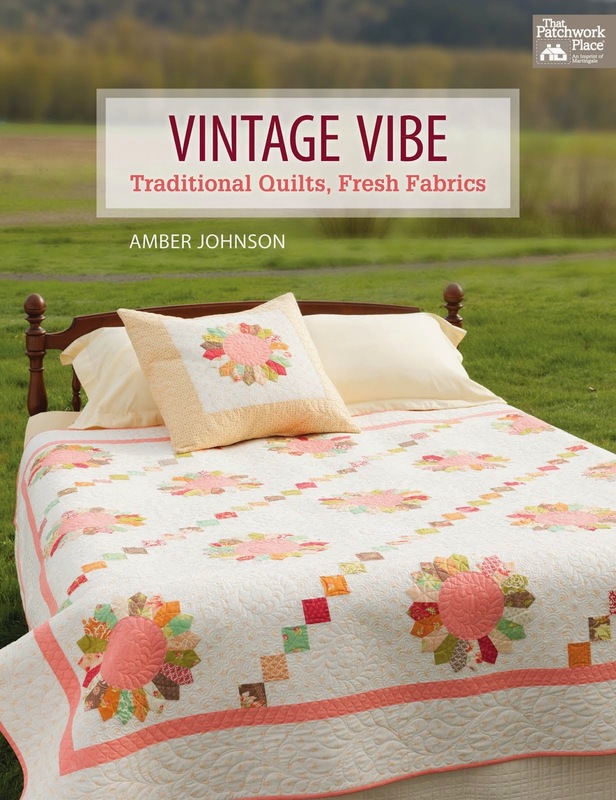 It's called Tilted Spools by Cyndi Walker. It can be found in Pretty Patchwork Quilts by Cyndi Walker or The Big Book of One-Block Quilts by The Patchwork Place. I used a small assortment of low-volume fabrics for the background (to give it a scrappy feel) and chose one of my all-time favorite all over quilting designs - the classic orange peel. 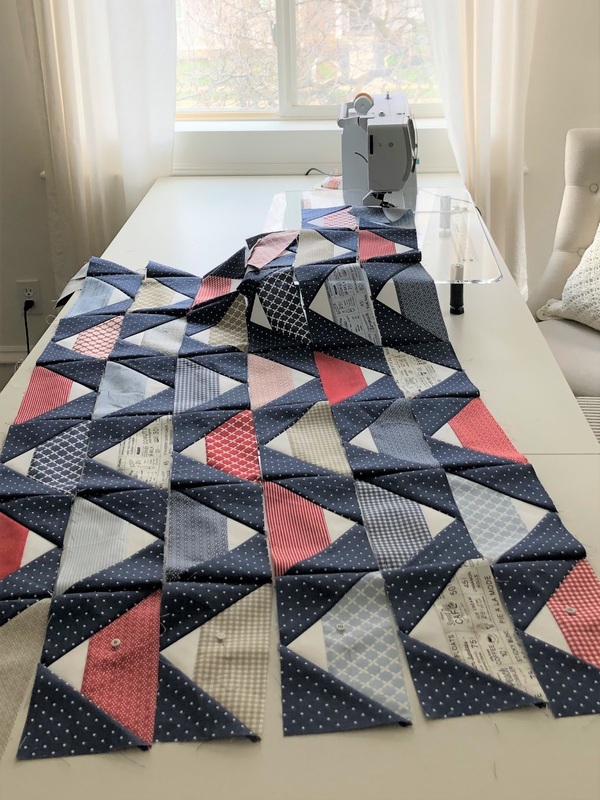 This quilt measures 48 1/2" x 64 1/2" finished. 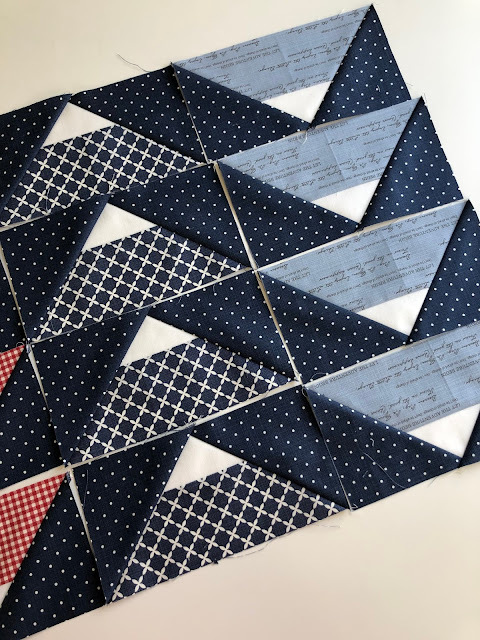 During the cutting process of Tilted Spools, I realized that I made a mistake and cut a bunch of 4 1/2" squares at the wrong size! Do you ever do that? 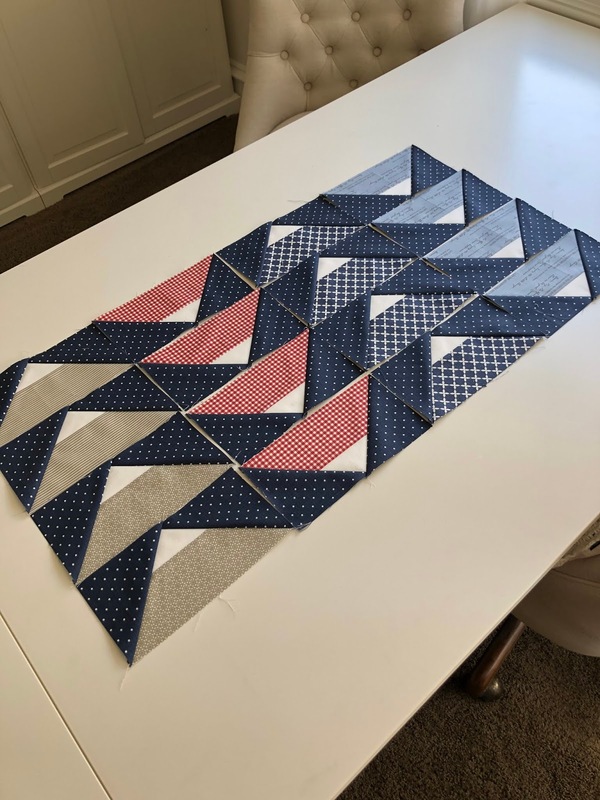 Well, luckily I had enough fabric left over to cut the correct size squares. 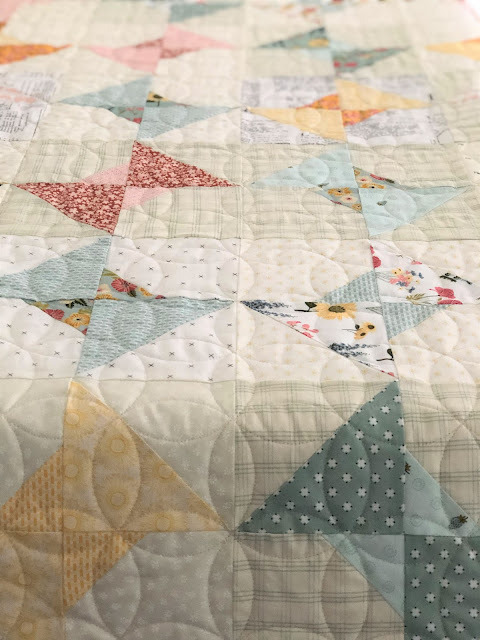 So I set the 4 1/2" squares aside and decided I would just make another quilt out of those! 39 1/2" x 47 1/2" finished. Cathy Barney quilted this one as well, except this time with loops and flowers. 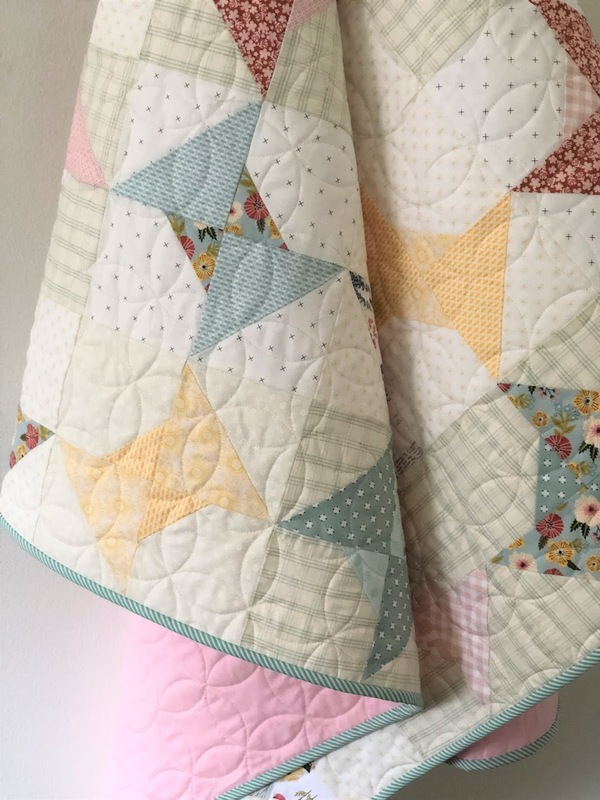 I really love how both of the quilts turned out. 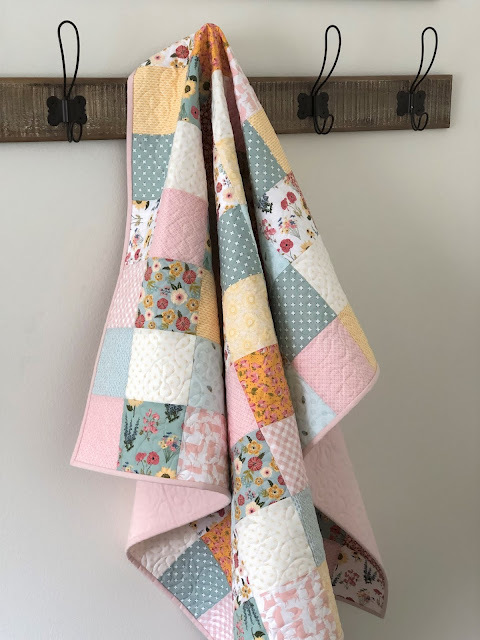 Prairie Sisters has a scrappy feel because of the florals, gingham, geometric prints, farm animals and a few pops of colors. And I am a "scrappy girl" through and through so I am a big fan! 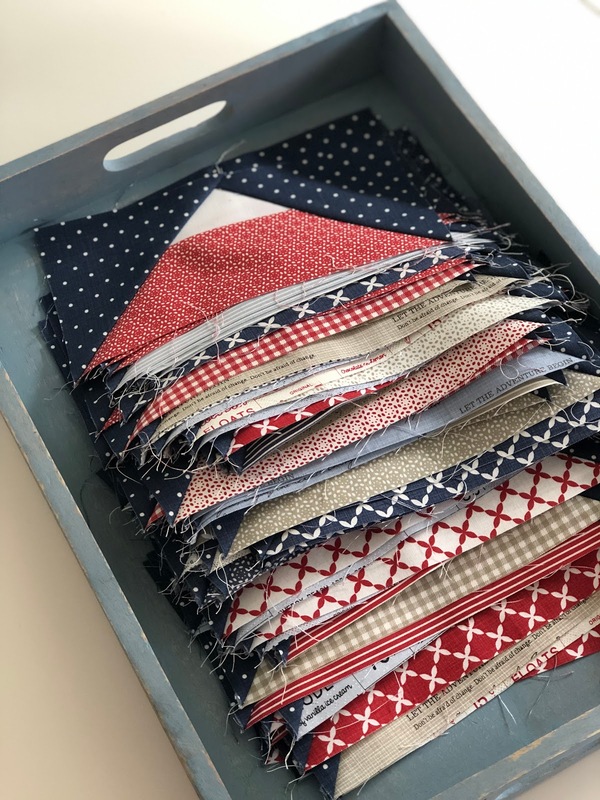 It was a joy to work with these new, unique fabrics. 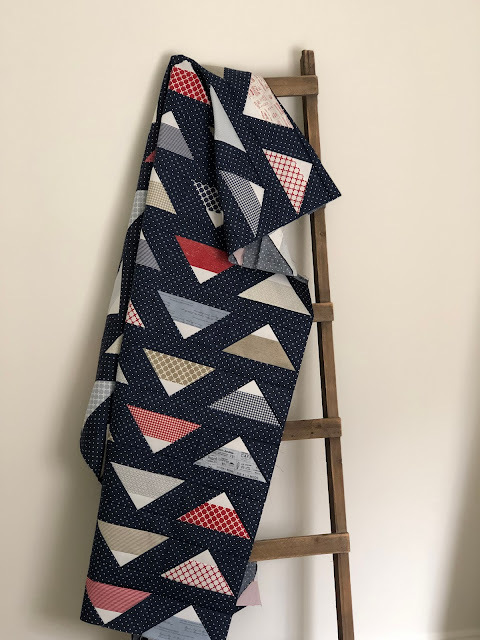 These quilts are listed for sale in my Etsy Shop. You can buy just one or both to coordinate with each other. 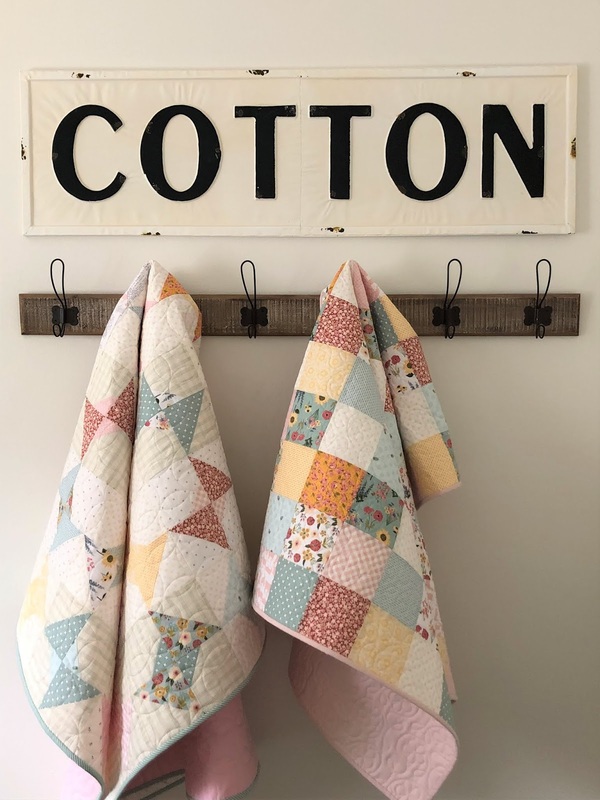 Be sure to visit the Prairie Sisters Farmhouse Fabric Tour Homepage for more inspiration. So today I want to refer you to a time-saving tutorial that you can use when making your blocks. It's my Quick Corner Triangle Piecing Method (sometimes it's called the "Tape Method"). 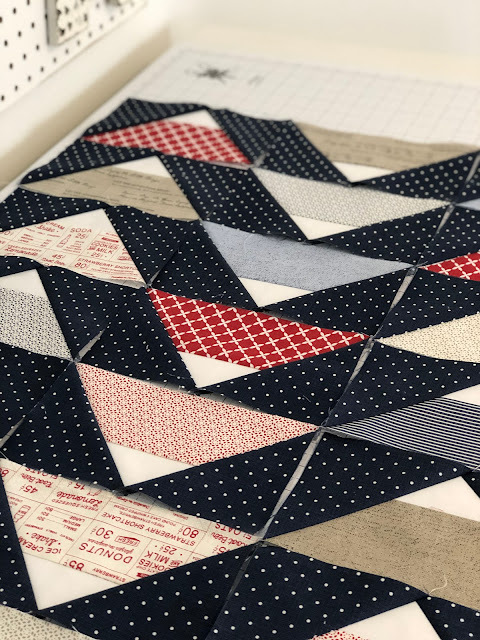 You can use this method any time a pattern instructs you to mark the wrong side of your squares with a diagonal line. It completely eliminates that step! Check out the tutorial. There are photos and a video to make it super easy to follow. 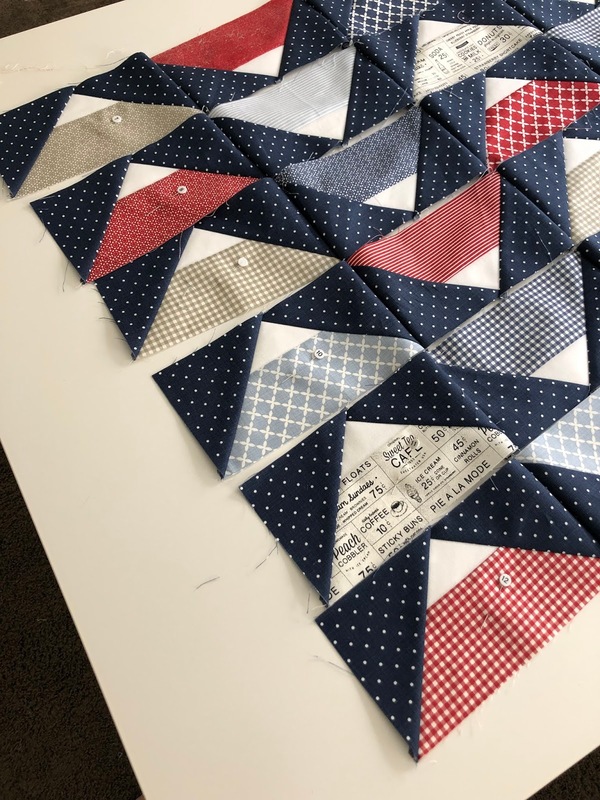 I love seeing these blocks come together! Don't forget, there will be a fabulous prize at the end of the Quilt Along for one lucky winner! 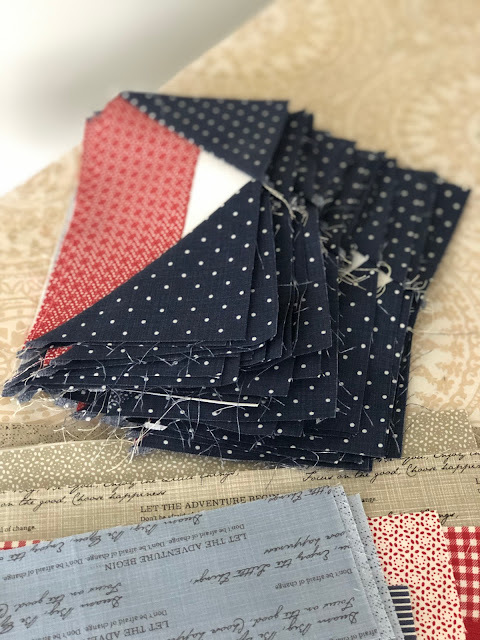 Barbara Eason of One Sweet Bee Designs has so generously offered to donate edge-to-edge quilting (medium density) to one winner (any size quilt!) The winner will just have to pay for shipping (she lives in TX. 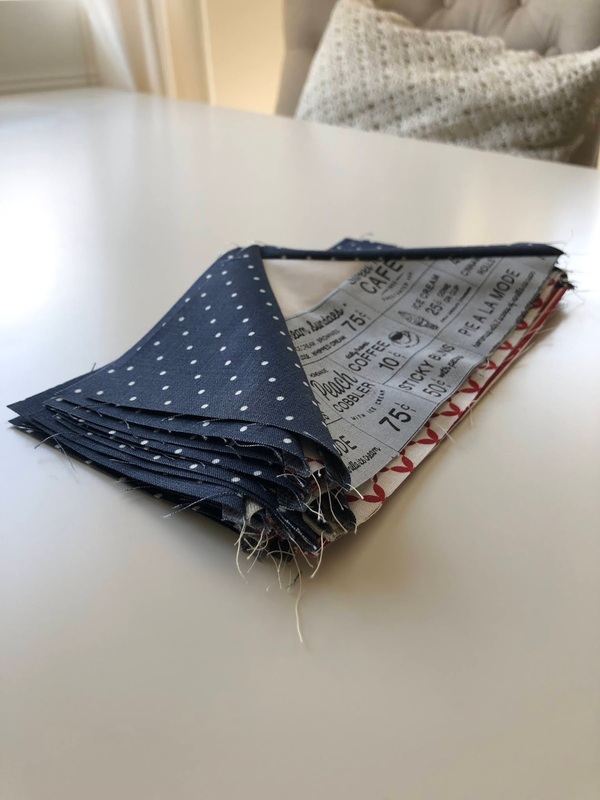 ), batting, and thread. 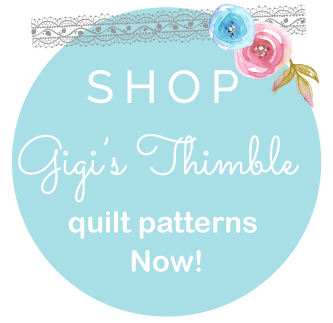 And to all the other participants she is offering 25% off the quilting on their Skipper Quilts! You can follower her on Instagram @onesweetbeequilts.